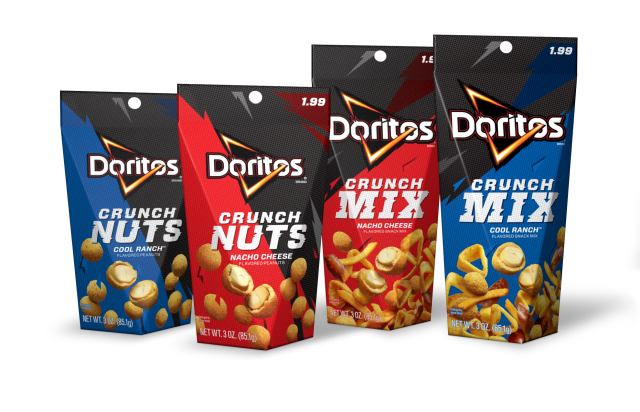 Frito-Lay looks to branch out that signature Doritos flavor with the launch of new Nacho Cheese and Cool Ranch Doritos Crunch Nuts as well as Nacho Cheese and Cool Ranch Doritos Crunch Mix. The main feature of the new snacks are roasted peanuts covered in a crunchy Doritos Nacho Cheese or Cool Ranch-flavored shell. The Crunch Nuts packages only contain the flavored peanuts while the Crunch Mix adds 3-D triangles, puffs, pretzel bites, and corn sticks (also seasoned with either Doritos Nacho Cheese or Cool Ranch flavors) to the mix. The new Doritos peanut snacks come in a different packaging from the brand's chips. Rather than a plastic bag they come in a "multidimensional" cardboard box with a plastic lining that's meant to be sturdy and portable and can be opened and closed with a foldable flap. You can find both Doritos Crunch Nuts and Crunch Mix at convenience stores and other retailers nationwide in 3-oz packages for a suggested price of $1.99.